We are committed as a Club to creating and maintaining a safe and positive environment for all people involved in hockey with the Club. You can read our commitment to safeguarding here. 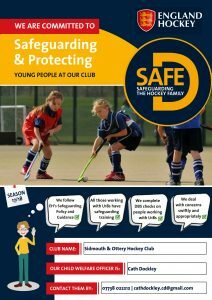 The Club adopts England Hockey (EH’s) policy on Safeguarding and Protecting Young People in Hockey, its associated policies and procedures. These policies and associated procedures can be found at www.englandhockey.co.uk/safe. We believe that all young people have the right to be safe and enjoy their hockey. We accept a responsibility to promote the welfare of young people and to protect them from harm, in partnership with The Hockey Family*. We all have a responsibility to recognise poor practice and abuse. If you have a concern or need advice, don’t hesitate to contact our Club Welfare Officer, Cath Dockley cathdockley.cd@gmail.com or 07738 022212. We have a Safeguarding page to assist our juniors if they have a safeguarding concern. 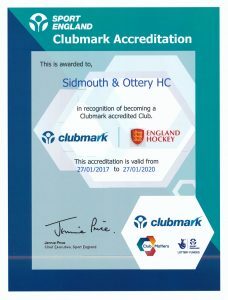 We were awarded England Hockey’s Clubmark accreditation in Jan 2017. This demonstrates that we are a well organised Club that provides the right environment for all members to train and enjoy playing our sport. We require volunteers in certain roles and appointments to complete safeguarding training. This will be either a Sports Coach UK workshop, NSPCC or an England Hockey on-line course. On top, our Welfare Officers complete a Time To Listen course. Our Lead coaches also hold Emergency First Aid qualifications. * HOCKEY FAMILY – The hockey family includes all individuals, clubs, associations and other organisations involved in any capacity in the game of hockey, whether members of England Hockey or not. For the avoidance of doubt, this includes all players and anyone working within hockey (in a paid or voluntary capacity, and whether as an employee or on a self-employed or other work basis) including all coaches, umpires, referees and other officials.